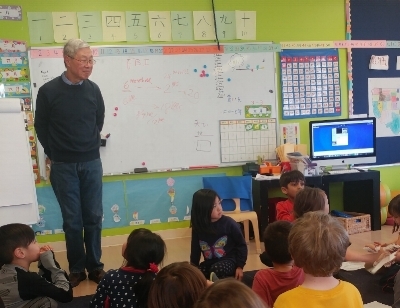 These aren’t words most parents are used to hearing from their five and six-year-olds, but the PKS kindergarten green class sought to impress with their “Field to Table” (从田野到餐桌) unit capstone project. The unit kicked off with a book called 苹果树 (The Apple Tree), which exposed the students to the life cycle of apple trees. The class put their learnings to use by planting seeds of their own and watching them grow, eventually leading to seedlings to take home and continue to nurture. The kids learned about the needs of plants: water, soil, sun and air (水, 土, 太阳, 空气) and how different climates produce different types of vegetables and fruit. Early in the unit, students hosted a grandparent who is a retired dentist. He shared with the children -- entirely in Mandarin -- how food affects our teeth, how our teeth grow, and how making poor diet choices can affect our gums and oral health. A field trip to Slide Ranch was another fun way to build the connection between the environment and the food that we eat. During their trip, the class met their three agreed objectives: get dirty, learn something new, and have fun! The children enjoyed various activities, including milking goats, picking herbs, and making cheese. Two parents came into class one day to facilitate hands-on learning. One parent showed students how to make Indian bread and ghee, while another parent showed them how colored water is absorbed by flowers and can change the color of the flowers! Each child got to bring home a flower in the color of their choice. In the process, they learned about volumes and how to measure liquids in different containers. At the conclusion of their unit, students decided to set up and host a pop-up cafe for parents. They brainstormed and voted on a menu, down to specific ingredients (decided by a survey on “favorite foods”). They visited the San Francisco Civic Center farmers market and learned about counting money. They used their newly-acquired skills to buy produce, bring it back to the classroom, and prepare tea and snacks. The next day, the class invited parents to sit down and review handwritten English PKS Cafe menus, written in English and Chinese. Servers took parents’ orders back to the kitchen, where kindergarten chefs assembled custom sandwiches and ladled bowls of vegetable soup. Parents were amazed at the quality (and quantity!) of the meal. The next day, the class wrote thank-you notes to the parents to show their appreciation for the opportunity to share their capstone experience with their families. As with any Unit of Exploration at PKS, teachers guided students through the key concepts of “Farm to Table,” but let the children’s own interests take hold. Without a doubt, they will be talking about the fun of “running their own restaurant” for years to come!